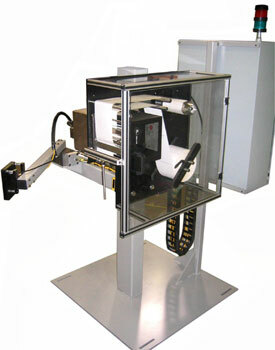 The SA2100 Dual Panel Pallet Label Applicator is designed to print and apply labels to the front and/or side of a pallet load. The machine is controlled by a PLC, which can communicate with the conveyor, stretch wrapper, and palletizer to ensure proper product handling during the labeling sequence. Full diagnostic reports and communication tracking are available, making troubleshooting easy. A rotating applicator arm takes a barcode label from a Zebra® PAX printer, rotates out 90 degrees, and applies it to the leading edge of the pallet. The arm returns to accept a duplicate label from the printer. The second label is then wiped onto the side panel as the pallet load is staged past the labeler. The rugged construction of the applicator arm and heavy-duty stand, the NEMA 12 UL listed industrial controls enclosure, and the other high quality commercial parts help ensure that the SA2100 will handle the rigors of 24/7 pallet load labeling.